Kirstiekins Blogs: Sponsoring a puppy! The For me, there isn't a more humbling human experience than helping others. I want to share something today that I have been wanting to do for a long time, and I have finally been given the opertinity to do so! Sponsoring a guide dog, is something I have always thought myself to poor to help with! Wanting to commit so many pound each month to a charity is easier than it sounds! You think you can do it, but then low and behold a few months later you are strapped for cash and can't pay! This is where the guide dogs have a better scheme, for poorer people who still want to donate! I explained to them that I was a student and I wanted to donate, and they came up with a way where I would be able to donate £13 every 4 months, thus letting me help both humans and animals at the same time! 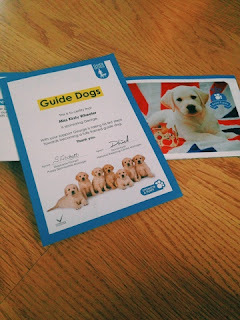 I was given a puppy pack full of photos and information, and a certificate to certify that I am sponsoring a guide dog! The dog that I am sponsoring is named George, and so can't wait to get more photos and to see how he is doing! Thinking about it, £13 every three months isn't that much! It's the price of one cinema ticket, or 3 lunches at uni! I can go without lunch a few times in order to help a puppy! If you want to get involved too, then please head over to their website for more information!